Scene 1: It’s a Tuesday in the Middle School library, and Sophie–a 5th grader–is arriving for library class. She has her iPad in her hands, and has evidently walked all the way from the Middle School building (close to 100 yards, admittedly across mostly open grass) holding it in front of her face, playing a game that the ever-resourceful tween population has been able to get to despite the firewall. Having made it all the way across campus, up the wide concrete-and-steel stairway (I tried not to imagine that part), across the lobby and through the library doors, Sophie is headed straight for the massive column that separates the circulation area from the seating area. Surely she sees that column? She looks up and does a last-second course correction before placidly making her way to the chairs where her class meets (back at the game, of course). Scene 2: On another library-class day, I tell the 5th grade that we will be using their iPads to access our library catalog. Several of them do not have the catalog app downloaded on their iPads, and their school-controlled App Manager doesn’t have it as an installation option either. Frantic swiping through home pages ensues. “That’s okay,” I say, “I’ll show you how to make a shortcut for your home screen.” They are still staring at their screens, swiping and yelping and talking to one another about how they do or do not have the app installed. “Guys,” I say. Swipe, swipe, yelp, yelp. “Boys and girls.” Swipe, yelp, swipe. Of course it all works out all right, but scenes like these underscore the fact that we may be in the middle school library, but this isn’t middle school. In all but geography, these are still Lower School students. I don’t know how many schools have moved their 5th grade classes up to the middle school. Our school did it a number of years ago as a response to running out of room in the Lower School classrooms, and overall it has worked very well; our middle school is divided, with the first floor limited to 7th- and 8th-grade classrooms, and the second floor to 5th and 6th. Day-to-day procedures and teaching methods are different for each section, even 5th grade compared to 6th, and these accommodations work well. As I’m sure all of us have noticed, there is a world of difference between a 5th grader and an 8th-grader! Fifth-graders may have shot up over the summer–especially the girls–but they are still, as our counsellor says, much more like little kids than teenagers. In the library, as well, we make distinctions between 5th graders and the rest of the middle school. For example, I have found that I need to introduce new concepts gradually, especially involving tech. Our 5th graders may be digital natives, but they do need guidance in approaching tech as an academic tool (and in being willing to stop and listen to directions!). At the beginning of the year, especially, when we are not actively using the iPads we put them down out of reach. Impulse control–the struggle is real! Also, our collection has to be carefully managed. 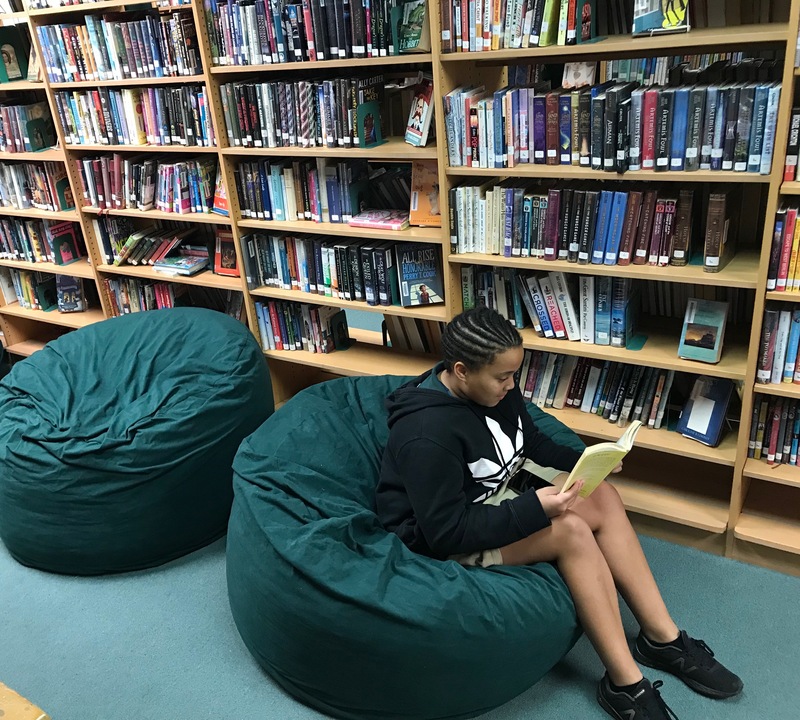 The Middle/Upper School library serves students in the 5th through 12th grades. While I hope we will one day have a new building with separate space for the middle-school collection, in the meantime I have to manage two very different collections catering to a wide range of tastes and interests. My predecessor handled this by choosing to skew the collection to the middle-school level; while this avoided any potential problems of inappropriate checkouts, the result was an entire group of students who were left without a collection. This year, I am developing a YA collection separate from the general fiction collection. These books have a different spine label, as well as a silvery holographic dot just above the spine label as a way to try and prevent “mistake” checkouts. These books are also in a separate area of the library where I can easily see who is browsing. While I do not plan to be a martinet about letting students browse that area, I do plan to limit checkouts to Upper School students. We’ll see how it works out! Finally, I have found that I have to be careful about seating for my 5th (okay, 6th too) graders. I purchased some awesome beanbags (stuffed with foam pieces, not polystyrene beads–highly recommended, with reservations as noted next) from Ultimate Sack (http://www.ultimatesack.com/) this fall. The students love them–mostly because they are actually big enough to take a nap in and therefore nearly impossible to move (hence the conditional recommendation as mentioned above). Did I mention that I bombed the spatial reasoning section on my high school career-skills test? It’s the size of a small car! Yep, these are very popular. So we began the year spending anywhere from 5-10 minutes at the beginning of every class discussing where the beanbags were (Upper Schoolers take them to the back to nap on), how to move them (roll them like you’re a dung beetle), who should to sit on them this week, who got to sit on them last week, and who can do the best parkour pattern using *all* of the beanbags. (Mrs.Falvey = facepalm). Needless to say we had to lay some ground rules for the beanbags! All this to say that even though they may be located in the middle school, 5th grade is still very much still in the Lower School for most of the year. And that is okay! iPads and pillar-obstacles and beanbags and keyword searches are all learning opportunities in their own right. I try to keep in mind that early-middle school students are still learning a lot about navigating life, and overall they are a joy to work with. I love their wide-open enthusiasm, the fact that they still love to read and be read to, and the fact that they will still speak to me when I see them on campus! But oh, how I wish I had measured those beanbags ahead of time! Most would say that I am in a happy position: Head Librarian at a school with a forward-thinking Head of School. 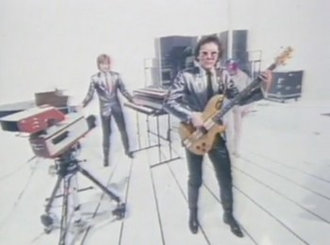 Still, this has caused me no end of trouble. If you think about it for a minute, I’m sure you can agree that it is much easier (I didn’t say Better, so don’t @ me) to be stuck someplace with an immovable and archaic administration, or at least miles of daunting red tape, so that one’s only responsibility is to bemoan in a vague way the fact that so much Could be Done, if only you had administrative support, or funding, or the right alignment of stars and omens. But when, instead, your HOS sits right there and says “What would your dream library look like?” with the idea of trying to work as much toward that goal as possible—well Hell’s Bells, that puts some pressure on a person! Instead of self-righteously falling asleep at night secure in the knowledge that there is Nothing to be Done, one has to start coming up with plans and ideas and links to pages. It’s terrifying! Once the panic subsided, I indulged my fondness for impractical and abstract thinking (so helpful). I began to ponder: what would my dream library look like? What is my grand vision for the Dorothy and Chalmers Poston Library? Not sure installing flying buttresses is what my HOS has in mind. 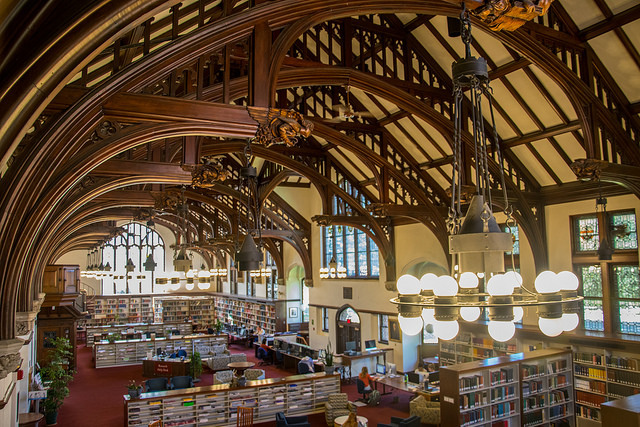 But this lovely picture of the library at Mount Holyoke College (my alma mater!) got me thinking: what do I love so much about that library, or any of the other great libraries (big or small) I have known? 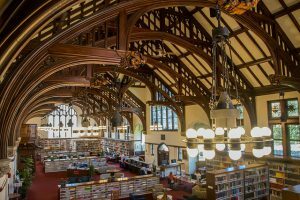 It is beautiful, of course–notice those nice sight lines all the way across the library; no high shelves blocking the main area, lots of comfy seating [fell asleep there many a time..but I digress]). What are the essential elements of a great library space? Wood and stained glass are nice, but so are bright steel, clean modern lines and expanses of clear glass. Maybe it is the different functions of the space. These have seen a lot of changes. Way back in my day as an undergraduate, the library was mostly a place of study, but there were group study spaces, quiet carrels, all sorts of different rooms (even one where they served tea once a week! ), and a language lab, and a nascent computer lab. Today of course libraries have maker spaces and collaborative creative spaces with equipment of all kinds. As fast as someone can think of a new permutation, there is a space for it. So pleasant and useful furniture is nice, sight lines are nice, different areas for different purposes are nice–is that the key to a thriving library? I think not (that’s kind of a pun–you’ll see). Thus far my answer–and certainly many of you may disagree–is not in the mutable functions or definitions of our space (media center, learning commons, research commons, information hub, design lab, tinker lab, maker space), but rather a focus, no matter what shiny new trend we are riding, on the immutable intent of our space–of its enduring purpose and function–of how we think of the library in connection with the mission and life of the school. The libraries I have loved–and any library worth its salt–is the heart of its school; a vital part of sustaining and supporting not just its academics but also its community. Though it seems we spend more and more of our lives online, school libraries are essential spaces for students, faculty, and all members of the school community to investigate, discover, collaborate, share, recharge, and just hang out. For this to happen, the library must be a vital and active presence in all aspects of school life: in daily academic work, in extra-curricular learning and entertainment, in community connections, and in future planning; it must be at or near the forefront of thinking and planning how best to serve the entire school community. Because our 21st-century lives are increasingly digital, it is easy for some people– administrators, parents, community members, even faculty–to wonder why we even have a physical library space at all. Some schools have eliminated formal library space, or at least print collections. Yet it is precisely because of the ubiquity of electronic media that we need a place to connect face-to-face and learn the skills we need to evaluate and manage information and learn the difficult rules of the road on the digital freeway. Those skills are best taught together, and even better if they are taught within the context of a physical space dedicated to the multality (made another new word!) of wide-ranging, thorough and conscientious academic endeavor alongside community connection, digital skill-building, and recreational events. The library, with its seemingly contradictory elements of static print materials alongside the quicksilver material of the digital world, underscores the code-switching inherent to life in the 21st century. Where else but the library, then, is it not just possible but natural to do print and digital research, work on a paper, connect for a group project in Google Docs, meet with a manga fan group (Insta of us all with flower crowns! ), read poetry during coffee-house (catch it on my YouTube channel! ), and post the play-by-play of a book discussion on Twitter? So if the most important thing is how we think about our libraries, will that dream list my HOS has asked for have anything on it? Sure! I’ve been collecting ideas from a number of wonderful independent schools in the Southeast (I’m open to travel farther afield in the name of thorough research. Dave Wee–I’m sure you’ve got library stuff I need to see, right?? ), and I am developing quite a list of desirable features for our library renovation: lower shelves and clear sight lines; varied lighting; moveable tables and bookcases; toddler-friendly book bins; comfy seating with charging ports; multi-configureable study spaces; bean bags and lounge chairs; expanded digital collections and updated print resources; special display space for yearbooks and memorabilia. These are all great things, ones I hope we can talk about adding to our space. 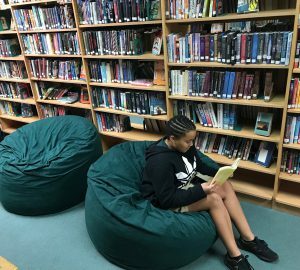 The most important design element of our library, however, will continue to be be how we think about it, continually reimagining its role as the heart of the school. We who work in schools have the benefit of starting fresh each school year: students move to new grades; we add new units of study or new materials to our toolkits; we welcome new faculty or those who move into new positions. Teachers often wish one another “Happy New Year!” in August; often our calendars and planners begin this month, and there is a sense of clean slates and fresh beginnings. The truth is, of course, there is always an opportunity to begin again, and that is one of the best lessons we can teach our students (and ourselves). If we allow ourselves a fresh start now and then, we can accept the idea that progress is a process with many beginnings: we learn from what we do, and then we try something new, or refine what we’ve done. But don’t feel limited by these dates; the point is that we have the freedom—the opportunity—even the responsibility to begin anew many times a year. It’s a sign of our super-saturated online life: I read a teaser the other day for an article about empathy and its decline in modern teens, and now I can’t find the full article. I’m sure it was some kind of discussion of the Michigan Empathy Study (http://bit.ly/1pCWfKf), and this Time article by author Michele Borba looks pretty similar (http://ti.me/2ckQNS0). Of course there is a lot going on right now to over-fill our brains. We’re all still reeling from the images of Hurricane Harvey’s devastation in Texas, and then suddenly Irma is mauling the Leeward Islands and barrelling toward Florida. For a time it looked like we here in South Carolina were in the crosshairs, though now Irma seems bent on bringing the first tropical storm to America’s heartland. Chargers in Charlottesville, mudslides in Bangladesh, Barbuda wiped clean, an earthquake in Mexico; it’s a lot to absorb, and after a point we just sort of shut down. Last Thursday night at our varsity football game we had an athletic wear drive for school teams in Texas, and Friday we had a dress-down day in support of another Texas charity. Our students and teachers are uniformly kind (even when being able to wear a tee shirt and shorts to school aren’t in the offing). But I also believe the study; we are all a bit more numb, a bit more removed, than we used to be. Also last Thursday night, my Godsister* and my nephew reached our house after a 15+-hour drive up from Miami. I helped unload the car: suitcases hurriedly packed; a cooler of food grabbed from the fridge; a couple of blankets; a guitar; and two paintings from my Godmother’s house. I hadn’t even thought about these paintings until that moment. They are interesting in and of themselves, because they were painted by The Highwaymen, a group of African-American painters who created stereotypical tropical scenes to sell on the side of the road or in those strange hotel-lobby sales you see sometimes: palm trees and water in the moonlight, or beach-y sunsets in oranges and pinks, with seagulls in little V-shaped dabs of paint (http://www.floridahighwaymenpaintings.com/). So they are cool all by themselves, but mostly those paintings represent my Godmother, and her 1960s-era Mackle house on Key Biscayne, and the years spent in and around the place, and people who are gone but who live on not just in our memories, but in the physical space we all shared. With that under threat, we were simultaneously glad to be together and safe, and stuck in some kind of limbo: what of these not-ultimately-important, but still so-important, things would be left when the wind and water recede? After witnessing from afar the suffering of others, in other parts of the world, I suddenly had the fear of loss and damage right here on my doorstep. This brought me back around to the headline I had seen earlier in the week, and the talk of empathy and the perception that it has declined. I also thought of news stories I have seen which have described people witnessing tragic events, and viewing those events, through their smartphones–using them as a lens for their experience, with the unintended secondary consequence of adding an artificial distance between us and what is happening to the other humans around us. The world continues to grow smaller; we witness the minutia of others’ suffering on tiny screens. It is too easy for us to become inured to what seems distant, whether it is half a world or two states away. As with everything, balance is key, isn’t it? The quest for information, images, video of the tragedy-of-the-moment must be counterweighted by challenging ourselves to engage actively and empathetically. We must learn–and help our students learn–how to juggle the sometimes thorny multiple existences we lead: information seekers, technology users, empathetic humans, watchers and hands-on helpers. As we seek to meet our own standards for educating our students to be not only excellent academicians, but also excellent humans, we must remind ourselves, and our students, of how incredibly small the world has become. We must find a way to keep ourselves from becoming tone-deaf. Empathy means gathering clothes and books and donations, and it also means working to keep our antennae finely tuned to what others are experiencing, when so much of the world is reducible to a meme and 140 characters. *Spellcheck doesn’t like this word–shame on it. Godsister = the daughter of my Godmother. A slightly more elegant and Episcopalian version of the Sister from Another Mister. There have been many discussions of the virtues/dangers of tech-enhanced learning (and living). One of the most interesting players on the field is the Waldorf School of Orange County which, according to several articles, eschews technology of all types while educating the children of quite a few Silicon Valley bigwigs (http://bit.ly/2nnHGC3 for one article, among many). Yet most schools across the country have embraced technology-enhanced learning, and efforts continue to provide all students access to what we hope will be transformational technology. At our school, we have very thoughtfully rolled out 1:1 technology over a number of years; at this point, we provide classroom sets of iPads to our younger grades, 1:1 at-school devices to 3rd and 4th graders, byod iPads to middle schoolers (5th-8th), and byod laptops to upper schoolers (9-12). They are all used in myriad ways over the course of the year—from keeping track of assignments, to taking tests, to creating interactive projects, to (inevitably) endless selfies. So what do you do after you have fully integrated tech into your learning program? You try turning it all off! Seriously, though, part of being a responsive and effective learning community is continuously evaluating the effectiveness of your teaching and learning tools. Hence: Tech-Free Day. The original day scheduled for the event, as you may or may not remember, turned out to be one of those Spring-with-a-chance-of-Tornadoes sort of days, so we rescheduled for April 19th. The day was designed, as Head of School Chris Hinchey said, “[to] help students and adults step back and gain perspective on their media habits and set goals for healthy habits moving forward.” With this goal in mind, we undertook a busy spring-semester Wednesday without using tech of any kind (yep, not even FitBits). That evening, the school partnered with another local school to show Screenagers, a powerful documentary about the effects of screen time on young people (https://youtu.be/LQx2X0BXgZg –highly recommend). No homework was assigned, and families were encouraged to remain tech-free through the evening at home as well. So what was my takeaway from going tech-free? (Other than the fact that it makes me very grumpy when I can’t use my Starbucks app to have my flat white waiting for me on the way to school)? The Good, the Bad, and the Just Plain Silly, or, I See Your Pencil, and I Raise You a Laptop! I would respond to the Waldorf School (look at their video—they knit: it’s very cool: https://youtu.be/fAnv39ixytA) the way I respond to the occasional visitor who comes into the library and asks why we still have books: Progress doesn’t mean throwing out what came before. We didn’t throw away bicycles when we invented cars–we just added more choices for getting the errands done. Being mindful about our use of technology (ok—about everything) is a great way to stay grounded in our ever faster-moving world. Going forward, I am going to be talking with my coworkers and my family about Tech Awareness, even more than Tech Free (because, Me Hiding in Drama Room). Connected Tech: use technology to connect with your family and friends: watch a movie and discuss; read the same book on your devices and discuss; write a song/create a stop-action video with your kids; create a book trailer for your book club [you DO belong to a book club, right? If not, FaceTime your friends and start one!]. Teen Tech Talk: talk to your teen (or tween, or third-grader) about the tech in their lives. What is their favorite tech tool? How does it enhance their lives (ironic tone/air quotes not allowed)? Ultimately, going tech-free for a day gave us (me) the chance to evaluate the role technology plays in our (my) daily teaching, learning and communicating. My teenagers tell me that I too often stare at my lap when we are together. As the mom of soon-to-be-fledged young adults, that is insanely stupid. My kids still want to talk to me! Put down the phone! Well, I had planned to write my next post about our school’s experiment with a Tech-Free Day this week; a day, our Headmaster explained, to “examine both the benefits and costs of technology in education and daily life.” But since the weather-people chose that day to predict a possible reenactment of Twister in our area, we postponed the experiment (because we needed our technology to communicate in case of severe weather dangers; point taken, Mother Nature). But thinking about our (already, in less than a generation) certainty that we *must* have our technology available all the time, and the accompanying belief that high-tech is always better than low-tech (more on that next time), also made me wonder about other assumptions we adhere to rather blindly. Below are the top-10 sacred cows (mine and others’) I am challenging in my library between the end of this year and the beginning of the next. What are yours? And might you ultimately agree with the idea (falsely attributed to Mark Twain*) that “sacred cows make the best hamburgers”? You will notice that I did not include the Dewey Decimal system in my bovine lineup. I still like my sacred cows grouped by subject classification (but that is a topic for another day). *Thank you, Garson O’Toole. You may have heard about his site on NPR this week. Quote Investigator (http://quoteinvestigator.com/) is devoted to tracking down the real people behind mis-attributed well-known quotes. He has a new book out as well: Hemingway Didn’t Say That: The Truth Behind Familiar Quotations. It’s a typical Tuesday morning: outside the Lower School doors, I hear a teacher reminding students to walk quietly into the library and find a place to sit. The door opens, and in scramble 14 of the cutest kids you’ll ever see. They are excited to be in the library, and race in a pack toward the reading rug. Soon I am surrounded by eager faces and hands ready to launch into our customary opening song, “Open, Shut Them.” Sometimes there’s a little scuffle over a particular spot on the reading rug, and usually they forget how to stand in line, and sometimes there is an odor that signals assistance needed, but things in general are just great. In August, I wasn’t 100% sure that would be the case. This fall, our school added two 2-year-old classes to our Early Childhood program. The head of our lower school, as well as the twos-teachers, were excited about the idea of their classes coming to the library every week, learning how libraries “work,” and checking out books to share in the classroom and at home. I was excited too, from a purely fun perspective—but I had my doubts about how it would go IRL. You see, I am not a control freak, per se (oh strike that, who am I kidding?!) But I also love books, and I love to read aloud, and I love to have fun in the library. So I was excited about that part of having the twos come up here, but I was also very trepidatious. I was comfortable with 3s, 4s, and Kindergarteners right up through 4th graders—but twos? The youngest would have just turned two before they started. How would that be? How would they learn library routines? How long would they be able to sit still? WHO WOULD CHANGE THEIR DIAPERS??? Facing the uncertainty of teaching two-year-olds, like facing any uncertain, unpredictable situation (Ahem), requires that we stop and ask ourselves a fundamental question: What is Most Important. And then keep our eyes on that, come Hell or high water. Stay “nimble” (I love it when I can use a buzz-word! ): be ready to change my programming, location, choice of materials, etc., based on the needs of the week, day or moment. Be prepared: have a variety of tools on hand (books, toys, data, plans) to support my goals. Speak Up and Foster Community: regularly connect with my community members (on- and off-campus) to be sure we are supporting one another and helping each other reach our goals daily, weekly, and forever. When I began thinking about teaching the twos last fall, I was worried that working with pre-readers would be less stimulating. Instead, I have grown as a professional in ways that are going to serve me well through many volatile years to come.